Pacific Parrotlet Personality, Food & Care – Pet Birds by Lafeber Co.
Pacific parrotlets are very spirited, and can become aggressive if left for too long without handling. Even though it is tiny, do not underestimate the strong beak – its bite is much stronger than a budgie. These pint-sized parrots don’t seem to realize that they are small because they have a large bird personality — outgoing, curious and, at times, downright feisty. The Pacific parrotlet has become one of the more popular small birds in the country, and is the most common of the various parrotlet species. They are referred to as “pocket parrots” — because of their small size, and they might very well sit in your shirt pocket as well! They have the personality of a “large bird in a small bird’s body,” and are often compared to Amazon parrots, a family of parrots said to be their close cousins. Indeed, they do resemble the Amazons, with short, stout bodies and a somewhat blunt tail. The male is green with a blue streak behind the eye and blue on the rump and wing-coverts. Females lack the blue coloring, and may or may not have a faint blue streak behind the eye. Parrotlets might be small but that doesn’t mean that a small cage will do. A spacious wide cage with 1/4 inch bar spacing is ideal. These are active birds that need their play space and plenty of toys to keep them busy. Parrot kabobs and other shreddable toys are parrotlet favorites, and they also like swings and boings. Parrotlets should have a pellet-based diet supplemented with fresh fruits and vegetables, as well as some seed. They also need a calcium source, such as cuttlebone. Diced fresh fruits and vegetables are also important for these birds. 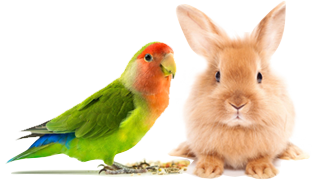 Some parrotlet-friendly fruits and vegetables are corn, bananas, oranges, carrots, pears, apples, peas, celery, pomegranates, green beans and kiwi. Allow tiny portions of nuts and seeds — but never more often than one serving per day. Dietary supplementation for calcium is also crucial. Cuttlebones, which are cuttlefish shells, are suitable for these purposes. For great daily diets, check out Lafeber’s Avi-Cakes, Nutri-Berries, and Premium Daily Diet. Parrotlets in general are feisty, affectionate and willful. If someone wants a great companion they should keep only one bird, because a pair of parrotlets will probably bond closely to each other to the exclusion of the owner. However, parrotlets are dimorphic and easy to pair up, and they do enjoy each other’s company. They can also be kept peaceably in groups in large aviaries, but it’s best to keep them separate from other species. They will quibble and fight over object and territory, so keep that in mind. Males and females make equally good companions depending on the individual. Companionability has much less to do with gender than it does with handling and socialization. Hand-fed parrotlets are very friendly, especially if the guardian takes the time to keep handling the bird. If left alone for too long, a single parrotlet can lose some of its companionability. The Pacific, in particular, does not understand that it is a tiny bird, and has little trouble challenging other animals and humans. The mutations are said to be more easy going than the nominate color (green), but they are also said to be less hardy. This may be a result of inbreeding. Because of the small size, the parrotlet may seem like a great companion for children, but kids would probably be better off with a budgie or something in the neophema family. The parrotlet can be temperamental and feisty, and its bite packs a wallop. Pacific Parrotlets are not noisy birds, making them great for people living in apartments. They will repeat words and simple phrases, but are not known to be the finest talkers of the parrotlet family. These birds can learn to mimic, but they aren’t the best talkers of the parrot family. Some individuals can learn quite a few words, however. They aren’t noisy, so neighbors won’t be disturbed. A parrotlet’s curiosity, combined with its small size, can make it accident prone and being stepped on can pose a real hazard. The Pacific parrotlet (Forpus coelestis) is one of two parrotlet species commonly available as pets — the other being the green-rumped parrotlet (Forpus passerinus) — either from pet stores, avian-specialty store or from bird breeders. In all parrotlet species, the nominate color is varying shades of green and some species, like the Pacific, come in a variety of mutations, such as blue, yellow, lutino, fallow, darker green, pastel, Isabel (cinnamon), albino, and white. The parrotlet is dimorphic, meaning that there’s a visible difference between the sexes, making it easy to choose pairs among mature birds.